Yu-Gi-Oh! TCG Event Coverage » ATTACK OF THE GIANT CARDS!! Winner #1! Home > 2018/03 - Salt Lake City, UT, Yu-Gi-Oh! Championship Series	> ATTACK OF THE GIANT CARDS!! Winner #1! Take a look at the winner of Saturday’s ATTACK OF THE GIANT CARD!! Tournament here at YCS Salt Lake City! 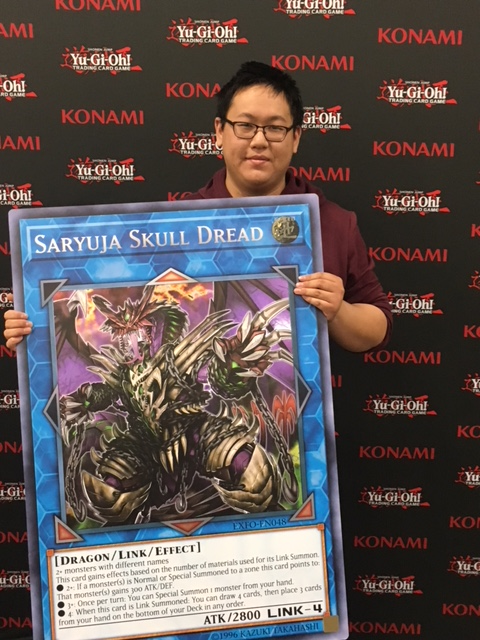 Lijie Deng from Fort Columns, Colorado used his Pendulum Magician Deck to best the competition and claim the first GIANT card of the weekend! Deng will be taking home a GIANT Saryuja Skull Dread. Congratulations! YCS Salt Lake City: Standings After Round 6 Saturday’s Dragon Duel Top 4 at YCS Salt Lake City!